The PPDU consist of 3 parts. 802.11n amendment further defines 3 additional preambles in 3 different PPDU. – consist of 10 short symbols (t1-t10) & 2 long symbols (T1-T2). – GI2 is long guard interval. – Following the PLCP preamble SIGNAL & DATA field each with GI preceding them. – short OFDM training symbol consist of 12 subcarriers. – long OFDM training symbol consists of 53 subcarriers. 1. Signal (8bits) – indicate which modulation method will be used for PSDU/MPDU. Bit 2 to indicate Transmit Frequency & Symbol clock dreived from same clock. Bit 7 also used to supplement Lenght field for CCK 11Mpbs. 3. 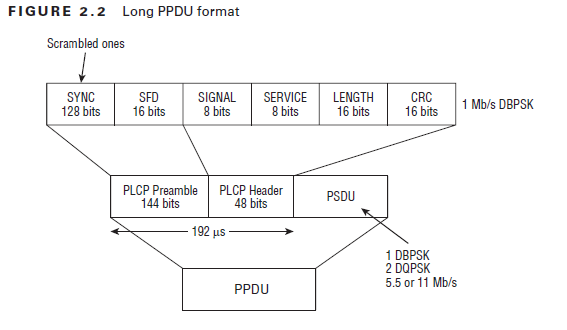 Length (16 bits) – Indicate number of microseconds (μS) that are required to transmit the PSDU. In OFDM transmission, SIGNAL field is 24 bits long. – First 4 bits (0-3) indicate the data rate (6,9,12,18,24,36,48,54). 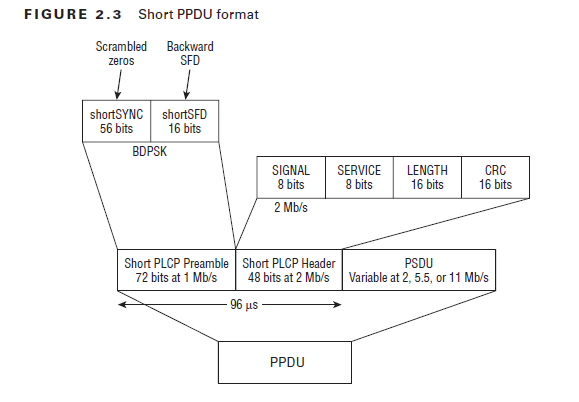 – Next 12 bits (bit 5-16) make up the PLCP Length field which indicate number of bytes in the PSDU. – Bit 17 will be parity bit for 0-16 bits. – Last 6 bits (bit 18-23) make up the SIGNAL TAIL with all 6 bits set to 0. – Consist of preamble that uses short & long training symbols (10 STF & 2 LTF). 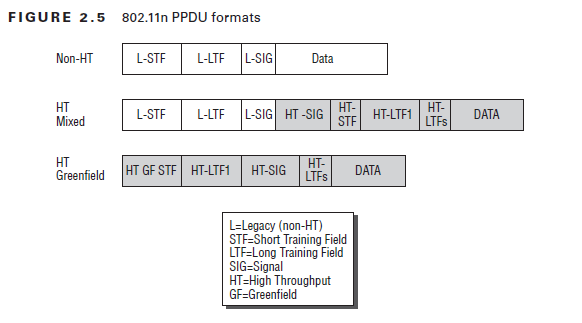 – Support for non-HT legacy format is mandatory for 802.11n radios. -Rest of the HT-mixed preamble & header cannot be decoded by legacy clients. – Tranmission can occur both 20MHz & 40MHz. – Preamble not compatible with legacy clients. 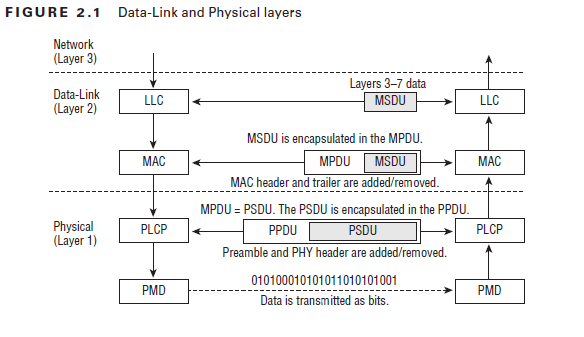 In IEEE 802.11n-2012 page 1639 Figure 19-1, it looks like PSDU is not exactly equal the MPDU since it has training sequence and other parts, but MPDU’s contents are MAC head, frame body and FCS. Why whose study material like CWAP say PSDU is MPDU? I had a quick question, is the value in the LENGTH field of PPDU copied into the DURATION/ID field at Layer 2?